Depending on the database, what you feel is important, and the project you’re working on; there may be a good number of fields that are either blank or unnecessary for your purposes. These fields can be reorganized or removed entirely from your view at any point. This only affects your view, and will not alter the experience of any other user. In the Doc and Table views, you will find a cog wheel at the top center of the screen. Clicking on this cog will bring up the View Settings option window. The table view and image view are separate, so you can have two different views depending on if you are looking in table view or doc view. The arrows on the bottom left will promote or demote a selected field, changing the order in which you see them. 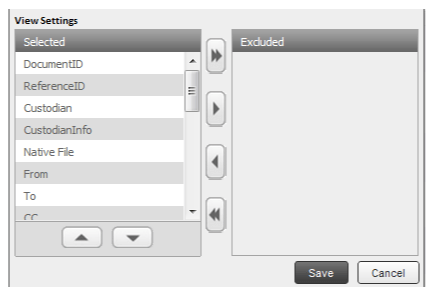 Using the arrows in the center to move fields to the Excluded column removes them from your view. Should you need to see them again later, you can open your view options again and move them back to the Selected side. Due to Xera keeping no temporary files on your computer when you log off, it will not retain your settings from session to session. If it is a view you intend to use frequently, you will want to save it for future use prior to exiting the database.